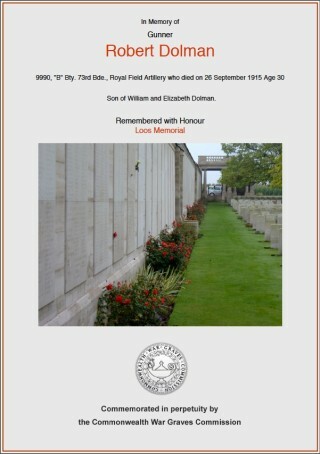 Robert Dolman was the son of William and Elizabeth Dolman. Born in Farndon, Nottinghamshire, he worked from Bottesford as a platelayer with the Great Northern Railway. He enlisted and was posted to France on the 8th July 1915 to serve with’ B’ Battery, 73rd Howitzer Brigade, Royal Field Artillery. Killed in Action: News has reached Bottesford that Gunner Robert Dol(e)man, of the R.F.A., was killed in action on the September 26th . 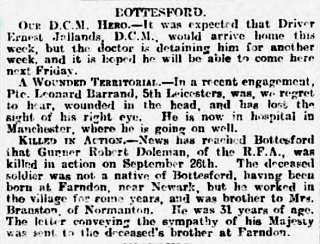 The deceased soldier was not a native of Bottesford, having been born in Farndon, near Newark, but he worked in the village for some years, and was the brother of Mrs. Branston of Normanton. He was 31 years of age. 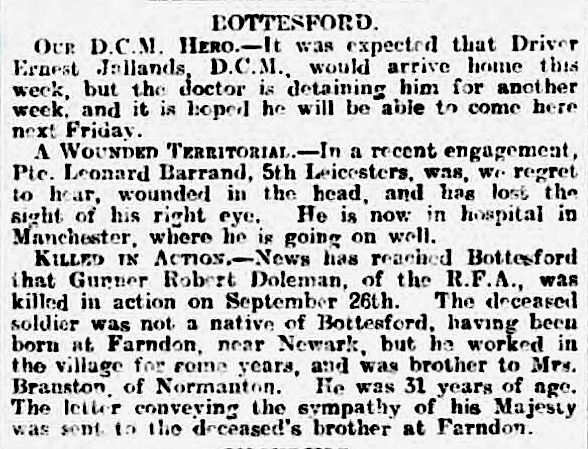 The letter conveying the sympathy of his Majesty was sent to the deceased’s brother at Farndon. He is officially listed as being killed on the 26th September 1915 on the second day of the Battle of Loos. At 10.00 a.m. The British Field Artillery begin a bombardment as a preliminary to renewing the attack. Many batteries had been moved up to positions in the open near Le Rutoire and Lone Tree. German Artillery opens and maintains fire on those exposed gunners. Robert Dolman’s battery, along with many others, was moved to that exposed area and came under heavy shell fire. The British Forces achieved initial success in the first two days of action. However, this was not to continue and the whole action became became mired into one of minor gains and attrition which came to an end some 6 weeks later in mid October. 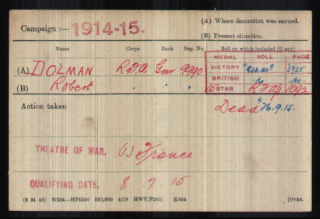 Robert Dolman was one of 7766 men who died in the Battle of Loos. 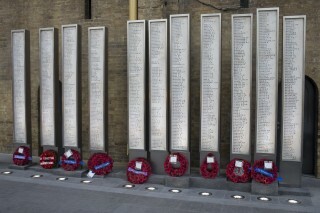 Most of those men have no known grave and are commemorated at the Loos Memorial. 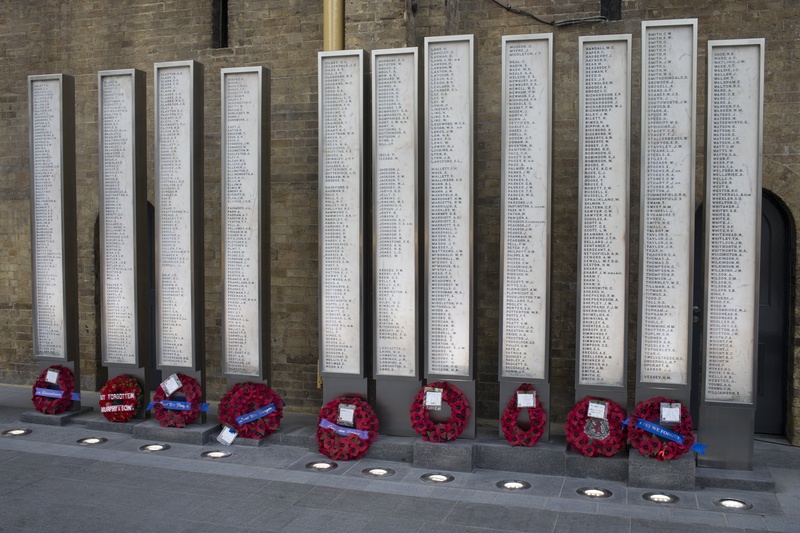 He is also remembered on the recently restored and reinstated GNR (WW1) and LNER (WW2) War Memorial in entrance to King’s Cross Railway Station, London. 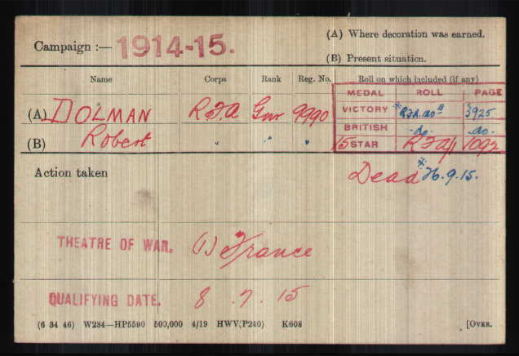 No service records survive for Robert Dolman, however his Medal Index Card is available in the National Archive as are a list of his ‘soldiers effects’. He left these to Florence Lunn. Florence is remembered as living in Bottesford with her son Eric (b. 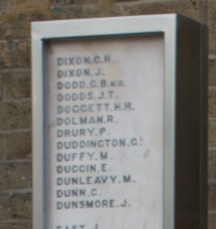 1907) who died in the 1950s. Eric’s birth certificate records his full name as Eric Dolman Lunn. When Eric was 3 years old in 1911. Florence (age 29) was living as a housekeeper at Dukes Farm, to the north of Muston with her father (age 60). Dukes Farm is a short walk across fields to where Eric’s sister lived in Normanton. Florence Lunn never married. She died in June 1971 age 90.